Whether a special occasion, Valentine's Day, or simply alone time for you and your sweetie, making a homemade meal for the two of you to enjoy together is a perfect way to spend date night. But if the recipes need to be gluten-free, creating something special can often feel limiting. These 11 recipes are not only gluten-free but also satisfying, interesting, and incredibly delicious. 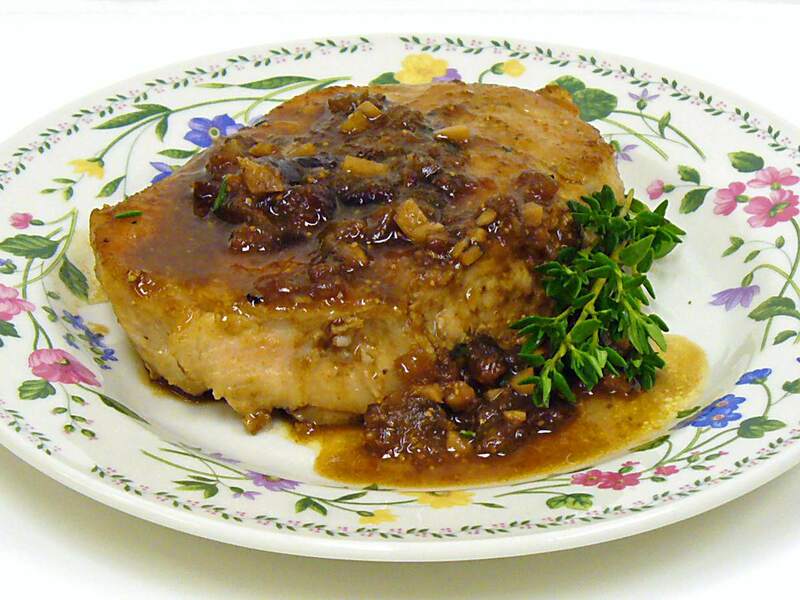 Pork Loin Chops with Fig Sauce Recipe. © 2006 Peggy Trowbridge Filippone, licensed to About.com, Inc. There is something about figs that seems sensual—perhaps it's their shape or texture, or maybe the rich color. When you add this delicate fruit to a dish, it transforms into something worth savoring. Season pork chops with chipotle pepper, then sear and simmer in a sauce of onion, garlic, red wine, thyme, and of course, figs. The result is a sweet and smoky dish that is gluten-free and sure to please all of the senses. Beef tenderloin is an impressive dish, and any impressive dish shows you care: the perfect sentiment for date night. Butterfly the beef, then layer with roasted red peppers, fresh basil leaves, and a creamy mixture of spinach, goat cheese, and herbs. Roll together, roast, slice and serve with a homemade port wine sauce. A rich and decadent dish can leave you feeling overstuffed. This fresh-tasting chicken recipe, however, is light yet full of flavor. Marinate bone-in chicken breasts in a mixture of lime zest and juice, garlic, and fresh cilantro, then roast until golden. Perfect served with corn and avocado salad. Shrimp are perfect for a romantic meal — maybe it's the way they curl into themselves, or their pretty shade of pink. This recipe highlights the shrimp's sweet flavor with a traditional scampi sauce of lemon, vermouth, and garlic. Served over zucchini noodles (a.k.a. "zoodles"), the dish becomes gluten-free, as well as healthy and delicious. A sizzling grilled steak is a perfect way to celebrate, and topping it with crumbled blue cheese makes it even more special. Season New York strip steaks and grill to your liking, then add the blue cheese so it melts slightly. Serve with roasted potatoes and cooked spinach. Chinese food can be very romantic — the two of you sharing a variety of dishes, passing the cartons to each other, savoring the bold flavors. This homemade recipe may not come in a cute takeout box, but it's still a great meal to serve on date night. Stir-fry thin slices of beef until crispy, then toss with a flavorful sauce of sweet bean sauce, chili paste, and Szechuan peppercorns, and serve hot over rice. Just be sure to check labels to make sure the bean sauce is gluten-free. A little spice can add heat to your date night, and this Thai-spiced salmon is the perfect recipe to bring that excitement to dinnertime. Pan-fry salmon, and drizzle with a flavorful sauce of green curry paste, kaffir lime leaves, and coconut milk. Garnish with finely diced red pepper and chopped fresh basil leaves. 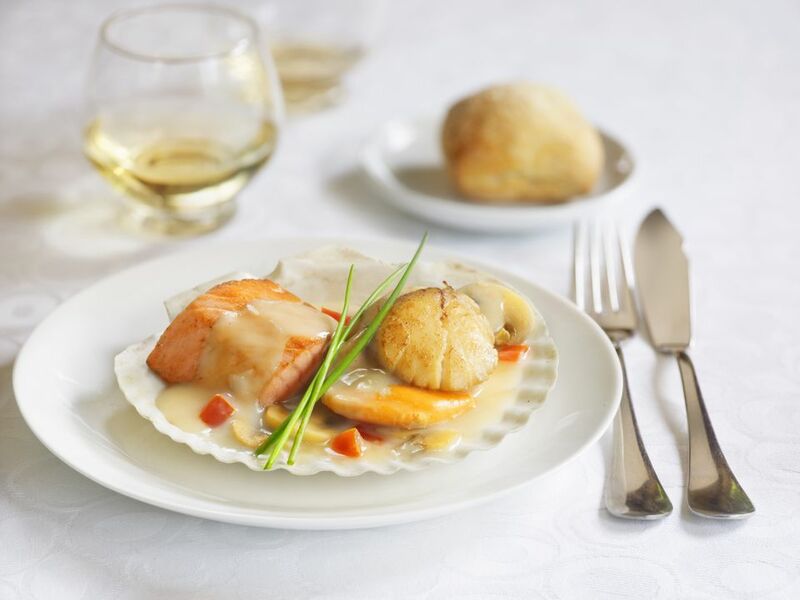 Woo your sweetheart with this succulent scallop dish, straight out of France's classic cookbooks. Arrange seared scallops artfully around steamed haricots verts accented with a citrusy orange-scented cream sauce. This is a dish to impress, sure to please all the senses. A beautiful fish dish always feels special and this salmon recipe is no exception. Finish seared salmon in the oven with a glaze of butter, brown sugar, bourbon, and toasted pecans for a gluten-free meal that takes less than 30 minutes to make. The nutty, sweet flavors infuse the fish with flavor, and help create a nice crust. Everything is better with bacon, including date night! This recipe will have your honey thinking you spent all day cooking, but it's really a cinch to prepare. The secret to this recipe's pumped-up flavor is sautéeing chicken, onion, and garlic in a mixture of bacon fat and butter. Finish the dish in the oven with a sprinkling of shredded cheese (just be sure to use a certified gluten-free brand like Kraft or Sargento). This chicken recipe takes only a few minutes to prepare but will look like you spent hours in the kitchen. Cover chicken breasts with a mixture of white wine, mushrooms, olive oil, lemon juice, garlic, and rosemary, then baked until cooked through. The rosemary creates a wonderful aroma, and complements the wine for a simple, elegant dish.